Camden "Garden Cottage" - Flowering in June! "As cozy as a cottage and as spacious as a house." Our 9th year. 100+ happy vacation groups of 2+ guests from 28 US States and 2 foreign countries. Many repeat visitors. "Home Away from Home." *Peaceful* country setting bordered by an extensive woodland and close to the center of town. In a quiet enclave, but this cottage is just a 15 -- 20 walk to downtown and the inner harbor. Restful residential neighborhood. Ample indoor space for privacy and to stretch out and relax. Private, off-street driveway and parking for exclusive use of guests. Many colorful informal gardens feature 50+ different flowering trees, shrubs, perennials and annuals on an acre of land, with woods adjacent. Separate screened-in summer house overlooks the gardens and catches the breezes. Owners live next door for easy communication, and love to give personal recommendations. Friendly assistance available at all times. We have a safe, large lawn where the kids can run about. You can keep an eye on them from the balcony/deck, or just enjoy a cup of coffee there in the morning or your own refreshments in the evening. Comfortable indoor open floor plan living and dining space. 2 bedrooms, each w/ a queen and each with its own full bathroom -- all on one floor. Privacy for two couples is assured. Washer and drier is on the living floor, not in the basement. Second and 3rd bedrooms are great for traveling companions or your visiting guests. Usual occupancy is 2, 3, or 4. A 5th guest can be accommodated for a $100 additional linens fee. House is 18 years new. Immaculate. We clean extensively between stays, and once a week for extended visits. Fresh flowers placed on your window sill weekly, or even more often upon request. About 1 mile or less to Camden's scenic harbor, schooners, shops, restaurants, library, post office, churches. 1,350 sq. ft. - Roomier than it appears in photos. Open floor plan. Substantial home-like furnishings; comfortable upholstered seating; ample storage. Casual, roomy. Furnished like a home, not like a motel, hotel, B&B, or upscale vacation rental. You can put your feet up. Dining room seating for 6. Getaway room -- use as an office or for naps. Has adesk/secretary and daybed, and breezy view of the gardens. Air conditioning by Mother Nature. A roomy 10 x 14' rustic camp-like wooden "Screen House" overlooks the gardens and catches the breezes. Outdoor table & chairs, charcoal grill upon request, morning sun on the deck, and a shady the hemlock reading nook for afternoons. Short drives to busy Camden, cozy Rockport, Mt. Battie State Park with ocean & mountain views, and to many other parks, lakes for swimming and boating, farmland, wineries, lighthouses, fine museums, & 25+ art galleries. Our location is central to Portland and the popular Boothbay Harbor region to the southwest and Bar Harbor and Acadia National Park to the northeast. Historic little Belfast is a great town to visit, just 20 minutes away, with its own allure of unique shops. galleries, restaurants, waterfront, old times movie theater, etc. A wide range of popular local mid-coast attractions and activities are available within every shorter distances. Since moving to this beautiful spot 28 years ago we have spent all the years since developing its gardens and landscape for beauty and enjoyment. We live right next door to the house/cottage (but conveniently out of sight), and this is our only vacation rental. We think of all visitors as our special guests. Our place, while in town, is peaceful and quiet. It is uniquely bordered by a (seldom used) community meeting hall, our lawn and gardens, and a large woodland. Because it is set well back from the street at the end of its own driveway, the cottage affords visitors the chance to enjoy more than an acre of quiet gardens and solitude while still being close to everything. The cottage is nestled in a naturalistic landscape of woods, lawn, trees, shrubs, and abundant flowers. Perfect for two couples to share. Also, a great place for elders or physically impaired, for recuperation, recovery, just plain rest, or convenient mobility. One-floor living, two full bathrooms, extra wide doorways, strategically placed grab rails, entrance ramp, close-in parking all make this uniquely suited for people with special needs. Both bath rooms will accommodate a wheelchair. Both shower/tub combos have grab bars for safety. These are regular shower/tub installations; they are not wheelchair accessible. We do not have a water view but are just a few minutes from Rockport & Camden harbors. Lincolnville Beach is a sandy swimming beach 15 minutes away. There are ocean views and scenic walks everywhere! The Samoset Resort with a professional level golf course is 15 minutes away. Point Lookout conference center is 15 minutes away. Camden Opera House bills top acts during summer. We are less than a mile and a nice walk to the center of Camden . . . shops, restaurants, and the schooner landing. We are a nice walk to the center of lovely Camden . . . shops and restaurants, the schooner landing, a classic National Landmark library and Olmstead designed park & amphitheatre and the harbor park. No elevator, but wheelchair accessible ramp and entry. We have lots and lots of books about Maine and by Maine authors. Jigsaw puzzles, playing cards and poker chips, and old favorites like Monopoly, Trivial Pursuit, and Scrabble. We can provide bocce for playing on the lawn. We have a few VHS tapes and some for kids. 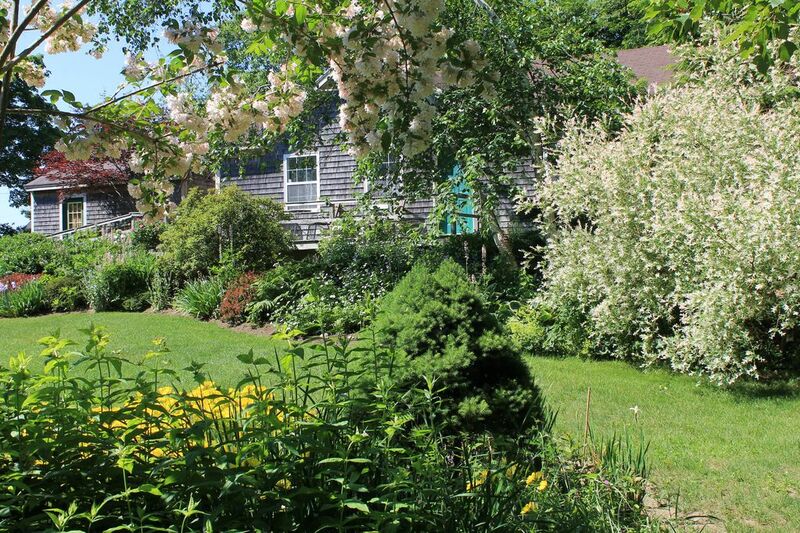 Your private, spacious lawn and gardens are surrounded by woods. Canoes & kayaks are available for rent at Maine Sport, a 5 minute drive from the cottage. It has everything you need to enjoy the outdoors, like a mini LL Bean. Access to the lakes and Bay is easy. Bicycles are available for rent at Maine Sport, just a 5 minute drive from the cottage. It has everything you need to enjoy the outdoors, like a mini LL Bean. Canoes and kayaks are available for rent at Maine Sport, just a 5 minute drive from the cottage. It has everything you need to enjoy the outdoors, like a mini LL Bean. The inarrow deck with a table and chairs is great for reading, whittling, knitting, or enjoying a cup of coffee while the sun comes up. It is fully shaded in the afternoon. Maine Sport, just a 5 minute drive from the cottage. has everything you need to enjoy the outdoors; it is like a mini LL Bean. There are outdoor public courts and indoor courts available nearby. A beautiful public golf course set in gently rolling hills is only 5 minutes away. It offers carts and also has a driving range and practice putting green. Another is just 15 minutes, in Rockland. The local YMCA, a 5 minute drive, has a full facility that includes two pools, a sauna, weight and exercise rooms and indoor track. It is open to visitors for a fee. There is an economical function hall and large parking area next door that is available by reservation for special occasions like reunions, weddings, receptions, anniversary and birthday parties, etc..The Garden Cottage is a convenient place for preparations and/or overnight accommodations for immediate family or special guests attending an event there. In addition, our lawn & garden area at the cottage is available for small outdoor gatherings by special arrangement. Our grounds are informal and especially colorful late June -- October. The cottage was lovely. It met all of our expectations and then some. The Blanchard's were wonderful hosts - available if needed, but respected our privacy. They had wonderful suggestions on places to go, how far away from the property, places to eat. I think we took advantage of nearly everything on their list and we were not disappointed. This was our first visit to Maine and it has left a lasting impression. Never have we hosted more enthusiastic, happy guests. You were fun to have and we enjoyed your enjoyment! The setting, the house itself, and the appurtenances in it--from pots and pans to cable TV--made us feel at home. In fact, being there like being at home, away. But as tourists, it was good to have an extensive collection of books and pamphlets about Maine at hand, and the helpfuless of our hosts concerning restaurants, places to see, and and boat trips to take--a high point of our trip. Got hot and humid early in August, unusual for the area, no air conditioning. Suggest wall air unit for emergency weather change. Owners are close by and very friendly and helpful. Our second four week stay. We do not list air conditioning in our description. We're not sure it's fair to downgrade our review due to unforeseen weather. We are looking into adding AC for the future. Who would have ever thought it would be needed on the coast of Maine? In almost 30 years here, we've never before experienced such a spell of 3 or 4 hot/humid nights in a month. I enjoyed my stay in the garden cottage immensely. It has all the comforts of home and the garden is lovely and tranquil. It is walking distance to the downtown area of Camden...a very charming town. The hosts were helpful with tips on where to go to eat or to explore the area. I thoroughly enjoyed meeting David and Paula! Thanks! We loved having you, and really appreciated how immaculately you left the cottage on your departure! This has been the third time for us at Garden Cottage and it still feels light home in a very peaceful setting. The Blanchards are very wonderful host with a willingness to help in any way that might be needed. We highly recommend this property in the center of the Maine coast. We were delighted with our stay in the charming cottage and with our wonderful hosts, David and Paula. The cottage was fully equipped, very clean and extremely comfortable. The view from the deck of the lovely gardens, while sipping your morning coffee was heavenly! The location is excellent for day trips to neighboring towns and harbors. I highly recommend this vacation rental. And, I would definitely go back again and again! Thanks for your nice comments! It's so nice when our guests appreciate and enjoy the work we do to make our gardens beautiful and peaceful. Don't see the information you need here? Call (207) 236-6468 and we'll be happy to answer your questions. Our rental week is Sunday pm to Sunday am, but other arrangements are possible. Sleeps up to 5. A queen-size bed in 2 separate rooms. Daybed in a 3rd room available at additional $10 / night. Ideal for two couples or a couple and one or two singles. Our 'Garden Cottage' is larger than it looks in the photos. We are not on the water or have a water view, but you'll save a bundle of dough and can walk to Camden Harbor or drive to Rockport Harbor in a few minutes. Camden is famous for its schooners and boating excursions. Within short drives are Rockport harbor, Mt. Battie State Park (miles of trails and fantastic view of Penobscot Bay), Megunticook Lake (fishing, boating, and swimming), Sail, Steam and Power Museum, Strand Theater, Owls Head Transportation Museum & Farnsworth Art Museum (Rockland), Center for Maine Contemporary Art (Rockport), shops, restaurants, galleries, Penobscot Marine Museum (Searsport), lighthouses, dozens of restaurants and unique shops, private nature sanctuaries, playgrounds and parks, and public golf courses. The Camden Opera House and Rockport Opera House host classical music and popular concerts, musicals, and other shows. The family-friendly Snow Bowl (Camden), with tobogganing, skiing, and snowboarding is just down the road. Kayak, canoe, bicycle rentals and outdoor recreational supplies of all types are readily available to buy or rent at nearby store Maine Sport.The Camden Public Library and Olmstead-designed amphitheater are a must see. Other Activities: Center for Furniture Craftsmanship, Maine Media Workshop offer courses to the public year 'round. Golf: Megunticook Golf Course / driving range is 5 minutes. Rockland Golf Course is 15 minutes. Samoset Resort golf course 15 minutes away. Ski: Camden Snow Bowl is 10 minuntes. Acadia National Park is 2 hours; a long day trip will take you there and back with time to see the sights. WE RENT FOR FULL WEEKS -- 7 NIGHTS, SUNDAY TO SUNDAY. 1. For long term rentals, your total payment can be divided into smaller payments by advance arrangement. Inquire. 2. Any way you pay on line, we pay a credit card processing fee, but you still pay a service fee to HomeAway for using its site (see #4 below). 3. No credit card? No problem: We also accept personal checks 4. HomeAway/VRBO terms: "9. Service Fee Payable by Travelers. We charge a service fee payable by travelers who book a property on the Site via the Site checkout. The service fee covers the use of the Site, including such features as 24/7 user support, and is calculated as a variable percentage of the total reservation amount (which may or may not include additional fees, taxes and damage deposits). Depending on the laws of the jurisdiction of the traveler and/or member, VAT may be charged on top of the service fee. The exact service fee (and any VAT, if applicable) charged will be displayed to travelers at the time of booking. The service fee plus applicable VAT will be charged after both the traveler and member accept the reservation. The service fee will only be refunded in the event a member accepts cancellation of the traveler’s reservation and refunds the entire rental amount. Any taxes alleged to be owed by any taxing authority on the service fee are the responsibility of HomeAway and members have no responsibility for any such claimed tax liability. Members agree not to encourage or advise a traveler to avoid or circumvent the service fee charged by HomeAway. 5. Day Bed Fee. There are two Queens and a day bed in the cottage, each in a separate room. The standard rates listed are for one and two beds. A third bed is available at an additional fee, as follows: + $70 + 9% tax for any week during which he day bed will be occupied for a night or more.